In our research, the Minox BL 8×33 binocular is the most popular among the Minox models. In this article we shall discuss details of this binocular and provide you a comprehensive review of this product and its features. We will even include what actual users say about it so you can see how different people feel about the BL 8×33. CLICK HERE to BUY the Minox BL 8×33 at Amazon @ a GREAT PRICE and any available DISCOUNT! The BL 8×33 is one of Minox’s Comfort Bridge styling design. It falls on the mid-size range and yet it is packed with full-size features. The Comfort Bridge styling is an open center bridge design which provides responsive handling –meaning – you can actually operate this binocular easily with just one hand! This binocular is designed so that it can operate on a temperature of 14 °F to 122 °F (or -10 °C to 50 °C). It can basically be used on a freezing day but not beyond minus 10 degrees centigrade and can pretty much withstand the hottest day during summer time. It has fully multi-coated lens system that delivers very high light transmission and minimizes stray light, giving you superb image resolution and contrast resulting to beautiful life like images. It has a very wide field of view of 420 feet per 1000 yards (or 140 meters @ 1000 meters (8.0 °)) so you won’t miss out on those amazing views and images, even those birds flying fast in the sky! The front lens diameter is 1.3 inches (33 mm) and with a magnification power of 8x, this results to an Exit Pupil Diameter of 0.16 inch (4.1 mm). The Close Distance focus capability of this binocular is 8.2 feet (2.5 meters) so you can actually look at some interesting objects more than a couple of meters away from you. The BL 8×33 comes with a fix magnification of 8x which also means that you don’t have the capability to vary the power. The 8x means your view is magnified eight (8) times compare to when you view an object using just the human eye. For most general outdoor purposes, the 8x magnification is more than enough for you to enjoy views and sceneries. The body is made up of “space-age polycarbonate” material which is fully encased in a shock dampening non-slip rubber armoring. This makes the BL 8×33 rugged, ergonomic yet looks really professional. The binocular is nitrogen purged to eliminate internal fogging and the entire optical assembly is sealed for waterproof performance down to a depth of 16 ½ feet (5 meters). The physical size of the BL 8×33 is 5.43 x 5.11 x 1.77 inches (138 x 130 x 45 mm) – that is, Height x Width x Depth – and it only weighs 22.9 ounces (650 grams). So you would realize that this binocular is really compact and light. It will fit snugly on your small outdoor bag. Another great feature of the BL 8×33 is the adjustable twist-up eye cups. The twist-up capability makes for an overall eye relief of 0.69 inch (17.5 mm). This is a pretty generous eye relief and is available for everyone – for those who wear glasses this is a welcome feature. Take note as well that all BL HD models are shipped as standard with a neoprene strap and robust carrying field-case so you don’t need to buy these items as separate accessories. Diopter Adjustment: +/- 4 dpt. Fix magnification – if you want a binocular that you can adjust the magnification, then this is not suitable for you. It is always great to hear from users who have had firsthand experience with the BL 8×33 that is why we lined up the following feedback from people who have actually purchased and used the product. Check them out! As you can see from the reviews and comments, users are in common in saying that the Minox BL 8×33 is a great binocular. They are totally satisfied with this pair of binoculars from Minox! 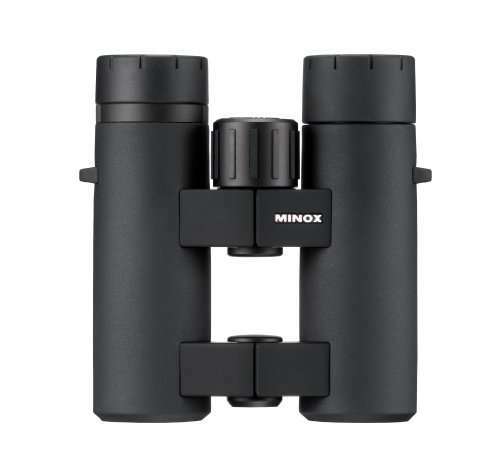 The Minox BL 8×33 is a compact, lightweight, mid-size range binocular that is packed with lots of features and comes with outstanding optical quality. It perfectly fits the definition of “high quality performance with a value price”. Based on user evaluations and reviews, this is indeed a great binocular model price-wise and performance-wise. We highly recommend you check out this highly-rated binocular. Click here to see the BL 8×33 product page. If you do not like the BL 8×33, you can click here to go back to our listing of the Top 5 Minox binoculars and check out the other binoculars in our list.